"Mail server crashed" worst nightmare for a System admin. Followed by tight Dead lines, incident reports, load of complains you have to listen to, Its a full fledged disaster. AD and DNS failed after de-commissioning the old SBS server. Recovering from full server backup was not an option and we had the Databases on a separate drive. Exchange 2010 Slandered only supports up to 5 Databases. 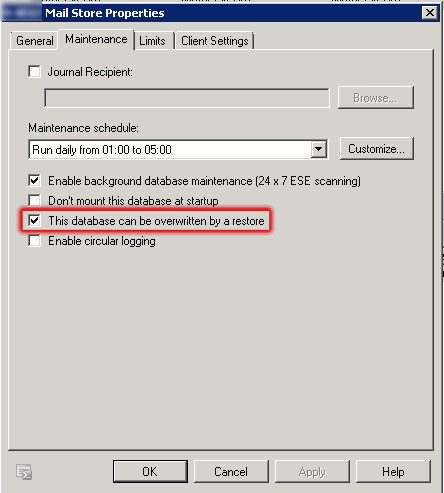 there are few method's to recover DB's on exchange 2010, This is the method we used. In this case we did not have any recent backups and we were not able to soft recover the DB since this is a new DC. so we had to do a hard recovery using this command. Mounting the Database using the Portability feature. Go to properties of the new DB > Maintenance Tab > Select the option "This Database can be overwritten by a restore"
Go to the Folder where the Database we repaired before is located and Rename it to "recoveryDB1"
Remember the Log files should be deleted or moved before you mount this DB. Operation terminated with error -1216 (JET_errAttachedDatabaseMismatch, An outstanding database attachment has been detected at the start or end of recovery, but database is missing or does not match attachment info) after 11.625 seconds. The new Database Log files are still present, Delete them or move them. Now you can go ahead and Attach the Mailboxes to the corresponding user accounts. Create new Mail stores's and Move the mail boxes to avoid future problems. Thanks for the step by step guide to recover database from Dirty-shutdown state. In this critical situation data becomes completely out of reach from the Exchange server users and possibly data loss. Although Eseutil tools are their but these utilities can be dangerous in hands of a novice user or a non-technical person. I would suggest to read carefully various guides and articles, available online before running these tools. For a novice user or to avoid the data loss situation it is good to go for a third party Exchange recovery tool like Stellar Phoenix Exchange recovery software . This application has easy to use GUI and effectively handles all data loss situations. Thanks for sharing this software. I would like also to suggest to one more utility which i got from Google. visit the url to get more information. Hi Malinda, I wonder that what does “◾the mailbox database can only be mounted on another Mailbox server within the same Exchange organization” means??? In my scenario, my company have an exchange organization with domain name DOMAIN.com. But now, we want to shutdown this Exchange 2010 Organization and build a totally new exchange server 2010 organization wit the same domain name DOMAIN.com, the only thing we save is the Mailbox Database .edb file. So with your opinion, could I copy the .edb file from the OLD Mailbox server to an Storage device and copy, mount it on a NEW Mailbox server following your instruction. but when installing exchange use the same Organization name. else the DB portability feature wont work as described above. Use Exchange Recovery solution that repairs and convert EDB data in PST file format. This is best solution for recovering EDB files and converting in PST file format easily. Thanks for sharing helpful information, I found good information at http://www.exchangemailboxrecovery.co.uk about how to recover exchange mailbox data form exchange server. It recovers permanently deleted mailbox data and convert to accessible outlook pst files data.